Most occupational noise regulations state that you should use at least a Type 2 Integrating Sound Level Meter that provides you with measurements of Lavg and LPeak. The meter should be verified by a suitably equipped laboratory when new and every year or two years. You also need a Calibrator to check the meter's function before making measurements. For basic occupational noise measurements, we recommend the standard Optimus Red Type 2 (order code CR162A) with Calibrator (order code CR514). These parts can be ordered together as Noise Measurement Kit CK162A. Type 1 or Type 2? - Most occupational noise regulations say Type 2 is adequate. 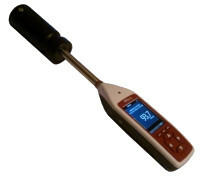 A Type 1 sound level meter is a little more accurate than a Type 2 model. It is also more expensive. If you are using the meter exclusively for occupational noise measurements then the regulations are quite clear: Type 2 is adequate. For this reason we recommend the Type 2 model. 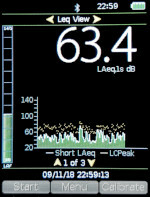 However, if you need to make other noise measurements, such as noise emitting from your factory into the local environment, then it might be wise to go for a Type 1 meter. In these instances the local authority (Environmental Health Officer for example) will usually expect measurements made with a Type 1 meter.